I have so much be thankful for this year! 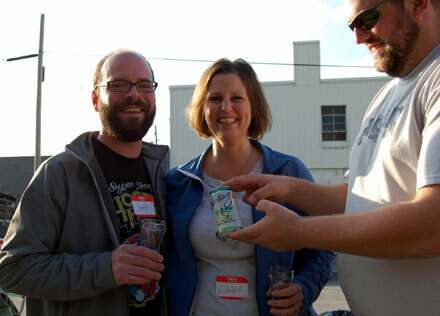 I am so grateful to be a part of this community and to share a love of beer with some amazing people. Thank you fellow Knights, Brewers, Distributors, and better beer drinkers for making this past year so great! 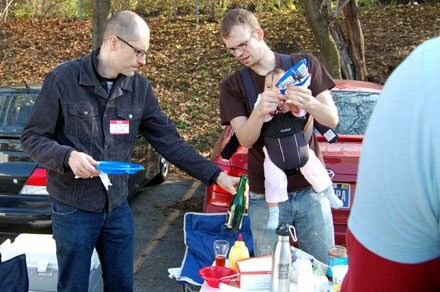 Thanks to all who came out for our Tailgate for Nothing. The weather was absolutely beautiful and the food and drinks that everyone brought were amazing! I want more Kool-Aid pickles! Saturday, December 5th at Lafayette Brewing Co in Lafayette: Christmas beer tapping - a Vienna lager finish "hopped" with 10# of organic heather flowers. Wednesday, December 9th from 7 to 10 at Zest! 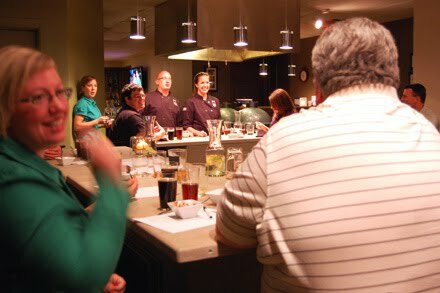 in Indianapolis: Beer vs. Wine Dinner, $59.00/person (includes tax & tip) and can purchase tickets at Zest! 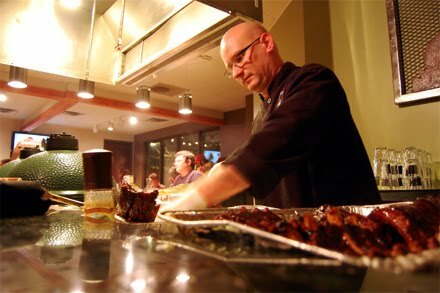 or by phone: 317.466.1853 or e-mail: contactus@zestexcitingfood.com. Reservations only (no walk-ins). Ouiatenon Wit Bier; Prophet's Rock Pale Ale; East Side Bitter; Pipers' Pride Scottish Ale; Tippecanoe Common Ale; Eighty-Five; Black Angus Oatmeal Stout and our Alpha Acid Test control beer: Alpha 60. Look for our annual Christmas beer to be released on Saturday, December 5. This year's version is a Vienna lager finish "hopped" with 10# of organic heather flowers. If you're a music fan, Lafayette Brewing has a fantastic weekend lined up. On Friday, Cleveland reggae legend Carlos Jones and the PLUS Band. On Saturday, local guitar superstar and past winner of Guitar Center's national Guitarmageddon competition, Michael Kelsey. And Sunday, a Friends of Bob show featuring singer, songwriter, frequent guest on Bob & Tom and former professional boxer (yes, he went toe-to-toe with Roberto "Hands of Stone" Duran), Paul Thorn. Wow! We're also taking reservations for a special night for the kids: Our first annual Dinner With Santa will be held on Monday, December 7. Give us a shout to reserve your table- our 2 sessions are filling quickly! Winter Warmer Barleywine draught and six-packs will hit the market on Monday, December 7th. 22 oz bottles of this winter seasonal will be available for the first time ever in early January. We plan to release several of our high gravity beers in 22s this year, including the Ard Ri Imperial Red, Infinite Wisdom Tripel, and Double Dragonfly IPA. We're also introducing a new seasonal beer to our lineup in early January. Be on the lookout for Upland's Komodo Dragonfly Black IPA on draught and in six-packs. The Winter Warlock is now on tap! This mildy spiced winter ale uses local Indiana honey and maple syrup for a sweetness that is not overpowering. The brewers have just filled the fermenter with a Double Stout and will make it available in the coming weeks. This promises to be a big bold stout with plenty of alcohol to make it a winter favorite. Pilsner is now on tap! Vintage Ales consisting of past years Barley Wines, Bourbon Barrel Porters and other past brews will be available in very limited quantities and will be sold for in-store consumption only. 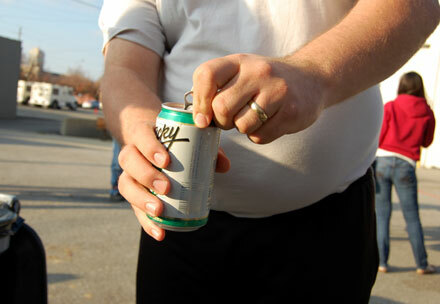 Mad Anthony's in Fort Wayne will be hosting it's annual New Year's Eve Bash. This is absolutely the best deal in town. $25.00 per ticket if purchased in advance. One price covers it ALL! Free food buffet, MadBrew, House Wines, Party Favors, DJ and dance Floor are all included in the price. Tickets will go on sale December 9th. Be sure to make plans now. There are lots of things happening around the brewery right now... We just poured 1,600 square feet of concrete to accommodate more tanks and increase our brewing capacity! I flew to Sacramento, CA last week to check out a couple of used 30 bbl Brite Beer Tanks that I am pleased to say checked out and will be arriving by mid-December. We will be putting them into service by the end of the year along with 2 - 30 bbl tanks we acquired from Upland earlier this year. These four tanks will be joined by another 4 new fermenters that we are having manufactured by Applied Beverage Technologies in Chicago. These new tanks should arrive around the same time our Canning Line will be arriving in mid-February! We expect to have cans of Sun King on the market in early March...So I'll keep you posted. Thursday, December 3rd @ 7:15 p.m.
Thursday, December 10th @ 7:30 p.m.
We bought some 22oz bottles of Two brothers Heavier handed IPA, currently on tap is Bell's rye Stout , Left handed Nitro Milk Stout, 3 Floyds Alpha King, Flying dog double dog double pale ale, and Brooklyn Brewing Brown ale. Lots of cool others waiting their turn including Sun King's Druid ESB that they were kind enough to dry hop the heck out of for us....and some others. 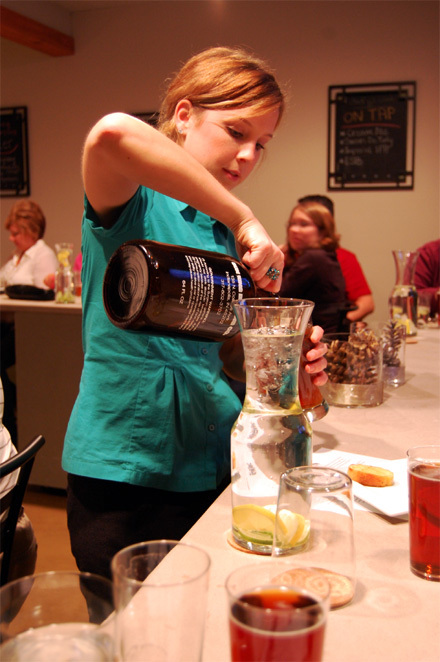 Call to find out exactly what is on tap currently, 317-733-8755. Sales are up 19% to last year and guest counts are up 30% Thank you all. 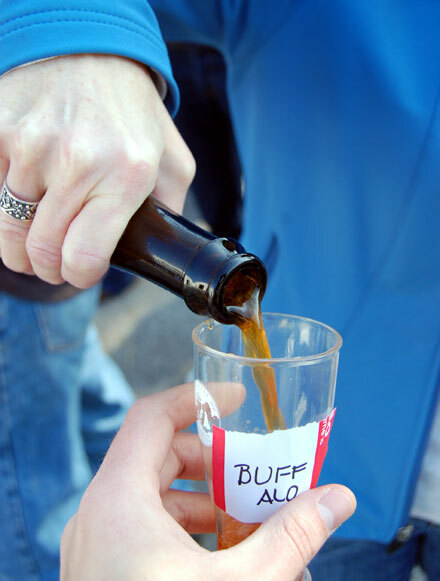 Another of our great traditions, we conclude the year’s beer tasting schedule with a bang. Featuring Holiday and Seasonal beers from around the world. Last year's tasting included over 21 different beers to sample. More details will be forthcoming as this one shapes up. We will be having the first Friday night beer tasting at the new Crown Downtown this Friday. We will probably have the "Grand Opening" then second week of Dec.
Coming on draft in the next week or two will be the DFH & Sierra collaboration beer, Life & Limb. We will also have the new IRS from Upland, Teddy Bear Kisses. We are also almost at full stock of all the winter brews we can possibly get our hands! Come check our fantastic selection on Thursdays nights while our weekly FREE BEER SAMPLINGS occur at the downtown store in Bloomington! $59.00/person (includes tax & tip) and can purchase tickets at Zest! 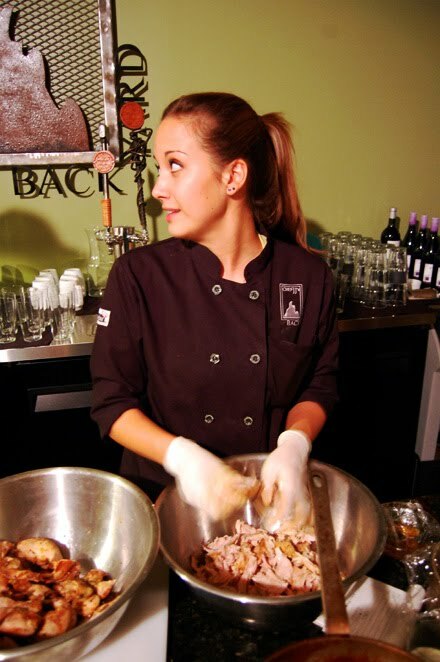 or by phone: 317.466.1853 or e-mail: contactus@zestexcitingfood.com. Reservations only (no walk-ins). I guess this is an annual tradition now. So what are you drinking today? 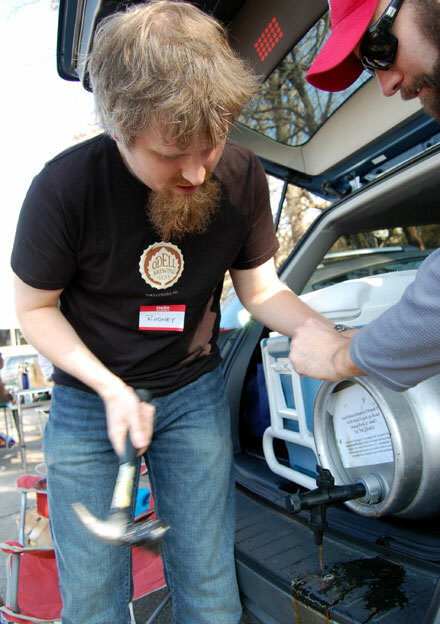 In case you weren't already aware, the Fall 2009 Rock Bottom brewer's dinner included the Harvest Mild that I brewed at Rock Bottom with the assistance of head brewer Jerry Sutherlin. The dinner itself featured squash in 3 of its 4 courses, which while delicious, limits the pairing possibilities. Here's a rundown of how they managed to pair 4 fairly different beers with one family of vegetables. Why it worked: The pumpkin ale at the downtown Rock Bottom is a hybrid of squash flavors and pumpkin pie spice. This year, Jerry added oats to the pumpkin ale to help increase the body and they came through thanks to the sweet, yet bready crepes and created a more dry finish in the beer. The pumpkin in the beer became even sweeter when matched with the similar sweet potato. 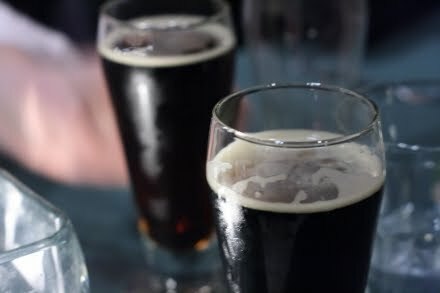 Why it worked: The dark mild ale features a lot of roasted flavors such as chocolate and coffee, as well as a fair amount of malty sweetness. 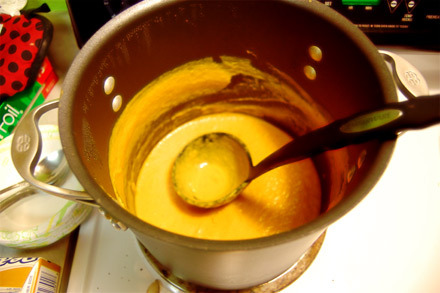 The soup was created with a variety of root vegetables and had a prominent dose of black pepper, which was drawn out by the beer. 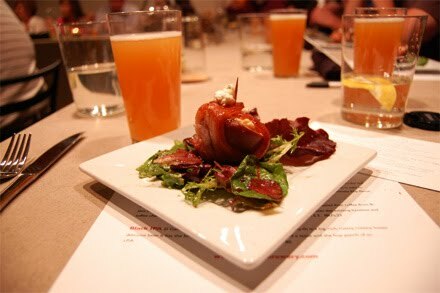 The sweet, malty body of the beer drew special attention to the sweetness of the squash in the dish. 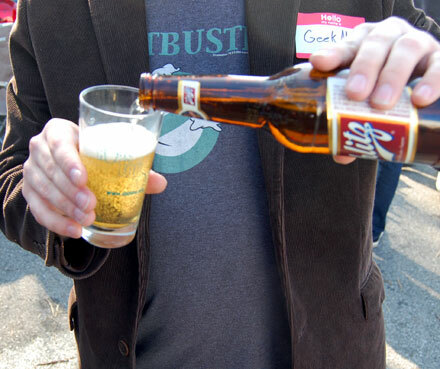 Why it worked: Vienna lager is the Swiss army knife of pairing beers. Sweet caramel malts and a light hopped character help this beer work in most situations. 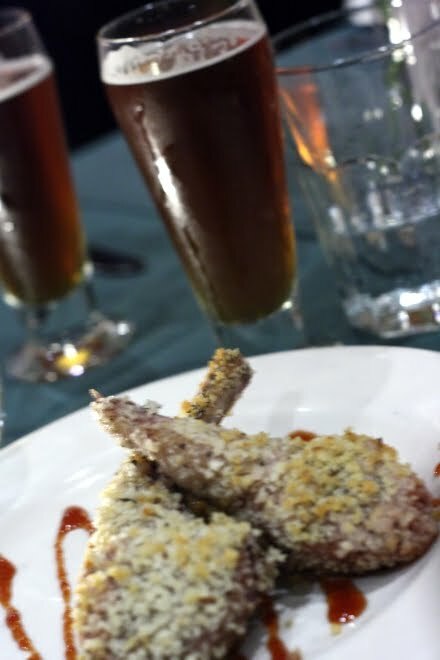 With the lamb, the slightly heavy body on the beer helped bulk up the tender lamb and the sweetness in the meat drew out caramel and brown sugar in the beer. The cherry glaze matched the sweet malts excellently. Why it worked: This course featured the most complex beer of the night, which was coincidentally my favorite. Orange, lemon, coriander, honey citrus hops and a hint of anise were all notable components in the beer that created a sweet, almost tropical pumpkin experience. 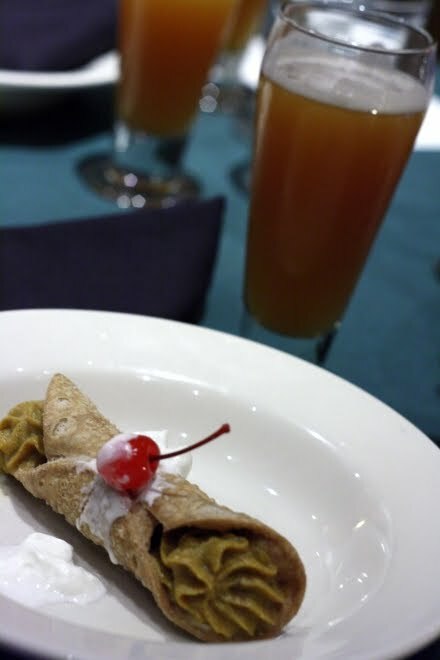 The higher alcohol and much heavier body of the beer was a nice match for the rich, fried exterior of the cannoli. 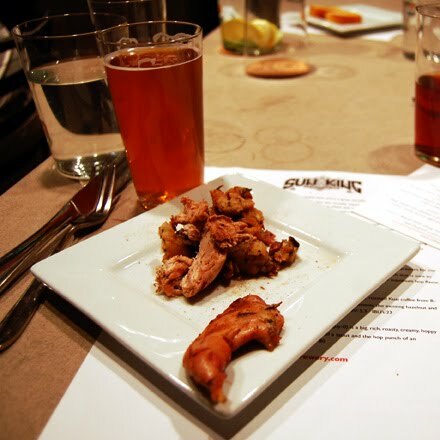 Pairing lessons: Higher gravity beers are needed to stand up to richer dishes; malty beers are good at accentuating sweetness; if a beer contains a special ingredient, such as pumpkin, it will easily pair with similar ingredients. I'm sure I don't need to tell you that Thanksgiving is this week, and if you're like us then your thoughts have already turned to what to drink. 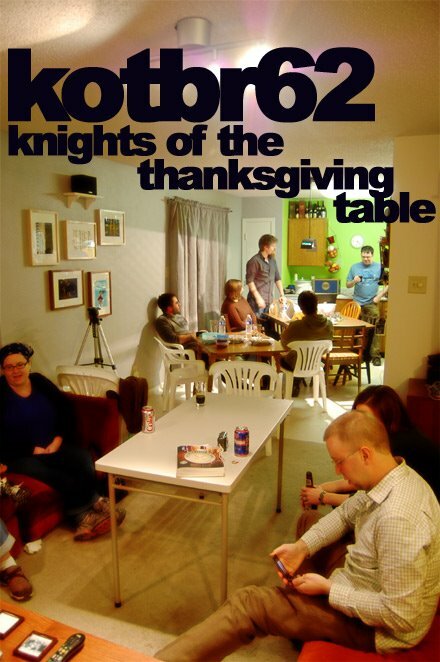 Last year we threw together a little HBG/KOTBR Thanksgiving, with beer to match. 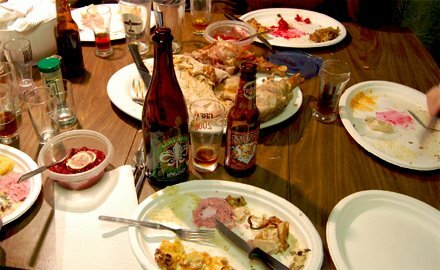 The results of that event are below..
A while back Matt R. (I think) made a suggestion that we might want to try doing a Thanksgiving beer pairing, complete with courses and beers to match each. We all agreed that that sounded like a good idea, and we laid out a menu of traditional Thanksgiving foods - carrot ginger soup, turkey, sweet potato pie, sweet potato casserole, cranberry relish, cranberry sauce, stuffing, green bean casserole, corn casserole, rolls, pumpkin pie..
One thing I learned from the Turtle/Rabbit/Squirrel beer paring was to not overdo it - but a full cast of Knights (short Jim - who is a Jewish Vegetarian Lawyer (and those people are weird)) meant that if anything, there would be more than enough beer. Because coordinating a write-up between a cast of nine is usually a trainwreck, I laid down one rule: No one leaves until we're gotten everything written up. While doling out responsibilities, the question was asked: "Are we reviewing the parings? The beer? The spirit of Thanksgiving?" "Yes, Rod, we're reviewing the spirit of Thanksgiving." What follows is out of order in more ways than one. And so..
Once every year, the ghost of Jesus rises from the dead to feast on the souls of the living. 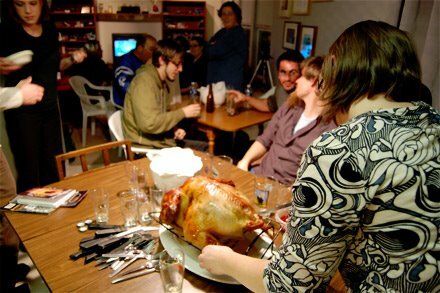 Every year we survive this atrocity, we celebrate our safety for another year through the holiday of Thanksgiving. The French have yet to discover this food match, so let me be the one to tell you - biere de garde is brilliant with turkey. And not just with turkey - it is also brilliant with the turnips, the stuffing, the cranberry sauce, the potatoes, the whole darned thing. That's a fairly convincing argument, right? We probably served this beer a little too cold to start. The bottle specifically says cellar temperature ("51-55 degrees F") and we served it straight out of the fridge. Later samples definitely showed a bit more fruitiness. Not that that necessarily would have helped with the Thanksgiving meal pairings. 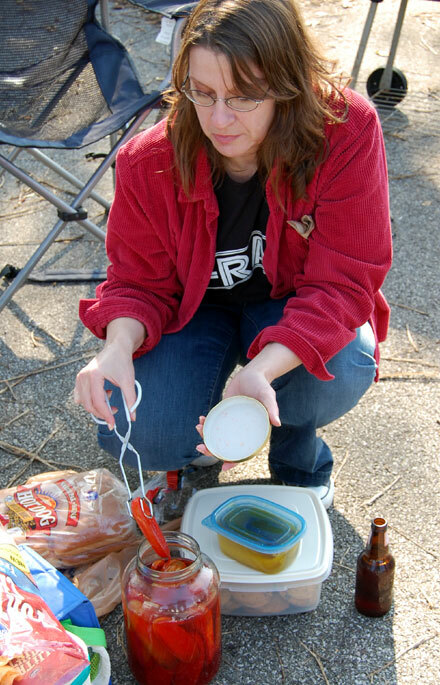 As for specific pairings, I thought the beer went particularly well with the green bean casserole. It was more of a contrasting pairing as opposed to a complimentary pairing. The fruitiness was interesting counterpoint to a dish full of green beans and mushrooms, though the caramelized onions linked up perfectly with the caramel malt flavors in the beer. The nose starts out with a bit of a raisin sourness with chocolate and caramel toffee notes. It has a nice dark caramel color that resembles caramel ice cream topping. Taking a sip of this 8.2% ABV brew is a bit misleading as it warms the palate and tends to meander through the malt sweetness. As it warms to room temperature you tend to taste the lightly toasted caramel malt and it balances out. For being a fairly boozy brew, this has a great balance to misrepresent the ABV. In regard to our Thanksgiving pairings, this worked really well with the sweet potato pie. 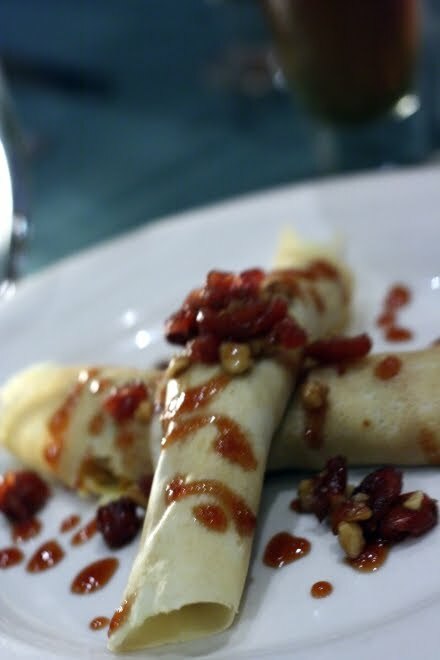 It brought out the maple syrup notes and complimented the toasted pecans on the top. There is a great pairing with the oyster stuffing with bits of salty mushrooms and the malty sweetness of the beer. Overall, this works quite well with the majority of dishes for the Thanksgiving meal. This is supposed to be a brown? We picked up a black liquorish nose, with hints of vanilla, smokeless tobacco, bourbony alcohol, soy sauce, molasses, and almond extract. 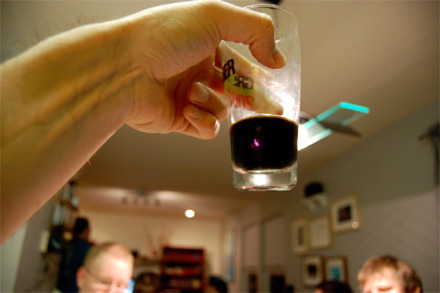 A deep black/purple/marron-maroon color filled the glass and left no lacing. This is an all out beer, with little in the way of subtlety. Black liquorish, sassafras, molasses, some cough medicine I had and hated as a kid (someone else said Dimetapp, bourbon, and toasted wood all came to play. We all agreed that this beer would be interesting with some age on it, but would it be good? Jason brought out this beer and it wasn't really paired with anything, but just went along nicely in between dinner and dessert. Is that a new meal time? Rouge's take on the brown ale adds some nutty complexity with the traditional brown ale base. The mouthfeel is a little lacking in carbonation, but it still cleared the way for pumpkin pie quite nicely. This is beer is neither offensive or something to really write home about, but it is of good quality and worth your time. For lack of a Left Hand Juju Ginger, we paired the carrot ginger soup with Chris' homebrew Sorachi IPA. Named after the Sorachi Ace hops, this IPA carried a very refreshing lemon flavor. Citrus and pine filled out the background but this IPA was noticeably lighter than others, while maintaining a very prominent bitterness. 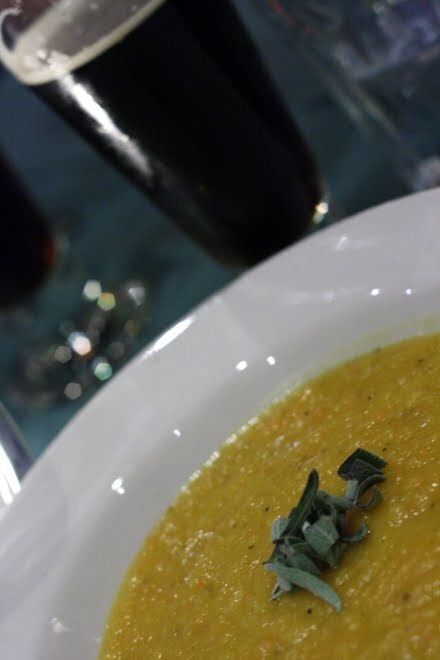 When paired with the ginger and black pepper flavors of the soup, a very floral character emerged and created a chamomile and heather flavor profile which blended nicely with the soup. The finish was a bit overpowering, as the hops quickly cleansed the palette of creamy squash and carrot. I think the lesson that we learned here is a citrus pale ale with a bit of a floral character would be a good pairing for ginger spiced squash or carrots. Ps. Thanks to the folks at Goose the Market for their great brining instructional video and for all their help with the bird. Even I managed to make an tasty and tender turkey, which is no small feat. 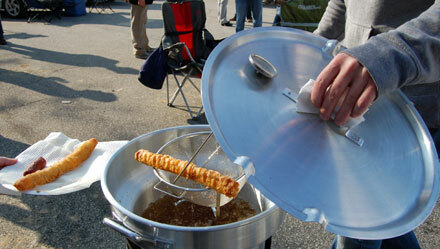 What: HBG's Tailgate for Nothing - an excuse to share great food and beer. Food selections included Coddog (a Sea Dog IPA breaded footlong hotdog shaped Cod portion), a collection of chilis, walking tacos, red beans and rice, vegetarian chickpea ragout, cherry koolaid pickles, chocolate chip cookies, vegetarian meatloaf, white castles, and passover brisket. Beer selections included Three Floyds Dark Lord, Russian River Pliny the Elder, an assortment of Schlafly Barleywines (06 and 08), Schlitz, Samichlaus, Rod's/Rock Bottom's Harvest Mild, Sun King Chocolate Stout, Cigar City (something), 2009 Deschutes Abyss, and a 20 year old can of Kentucky Derby Collector's Edition Little Kings. 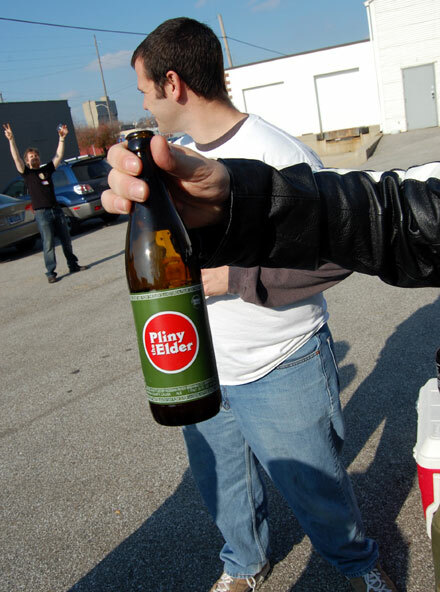 Why: We really wanted to share rare beer with the public, and start a tradition of food and beer sharing tailgate events at breweries around the state. 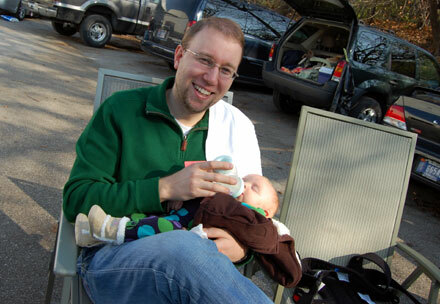 Also worth noting: We hope to do this quarterly, and look forward to seeing you next time. 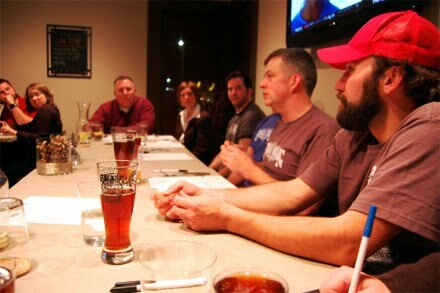 Lately, the Knights of the Beer Roundtable have been very busy. We have a fairly long "to-do list" that we've slowly been whittling away at (Mike never lets us forget about the list). But just when we've crossed several things off of the list, more beer events pop up, so the list gets longer again. It's a never-ending process, but one that we're happily stuck in. In keeping with this theme, we found ourselves occupied with a beer event every night last week. 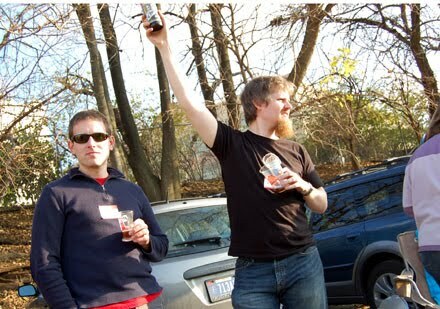 Because we all have lives outside of the beer world, not all of us could attend every event. Therefore, we decided to spread out the responsibility. On Wednesday, Gina, Matt E., and I hit MacNiven's (339 Massachusetts Ave., Indy, (317) 632-7268) for a special tapping of Goose Island's 2009 Bourbon County Stout (13% ABV). Even though we reviewed the 2008 BCS back in June, we felt that it was too good to pass up the opportunity to get a fresh pour of the 2009 vintage ($10.00 a snifter at MacNiven's). Goose Island brewmaster Greg Hall came up with the recipe for BCS and brewed the first batch at Goose Island's Clybourne Avenue brewpub back in 1992. Originally, the beer was aged in Jim Beam barrels, but the brewery has been using 12- to 14-year-aged bourbon barrels from Heaven Hill Distilleries since 2006. 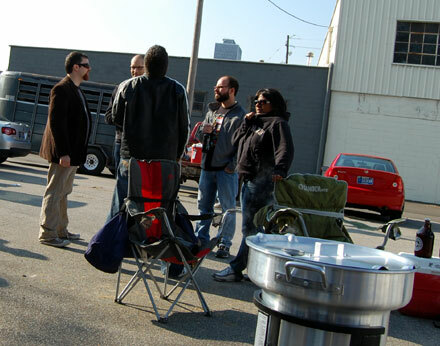 This year's BCS was brewed in honor of the 1000th batch brewed at the brewery's Clybourne Avenue location. I find some bourbon-barrel-aged stouts to be too heavy with the bourbon notes. To my palate, these sorts of beers taste like an imperial stout spiked with a shot or two of bourbon, so the bourbon barrel aging ends up overwhelming the beer rather than enhancing it. The 2009 BCS, however, has a noticeable yet nicely subdued bourbon character and is quite smooth for a bourbon-barrel-aged stout. Indeed, the alcohol is hidden well in a beer that ought to be pretty hot. Moreover, the nose and flavor contain a sumptuous mix of vanilla, chocolate, and cherries. The cherry and vanilla notes are front and center, blending together in a wonderful sweetness that lingers on the tongue. This beer is exemplary and merits the rare perfect mug rating. Get down to MacNiven's while the keg lasts (if it hasn't already blown). 5.00 Mugs. Goose Island has really outdone themselves with this year's release of Bourbon County Stout. From the new packaging to the remarkably drinkable beer, the BCS really exceeded my expectations. The nose is of chocolate, vanilla, and bourbon. The flavor is like a liquored up and velvety chocolate truffle. 4.25 Mugs. As of press time, Matt was too busy working on his latest H.P. Lovecraft-ish novel to get his review completed. Fortunately, we do have his mug score: 4.30 Mugs. This is our second time at the Back Yard for a Sun King beer dinner. We were in the company of both familiar and unfamiliar faces and it is great to see the interest arising from both craft beer lovers and beginners alike. These dinners are always great because the pairings are always very thoughtful. 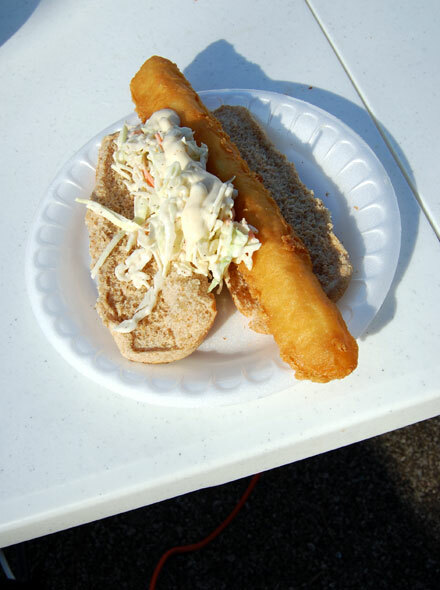 They always seem to find creative ways to enhance the best parts of the food and beer. Appetizer: Sunlight Cream Ale with a chipotle infused olive oil. 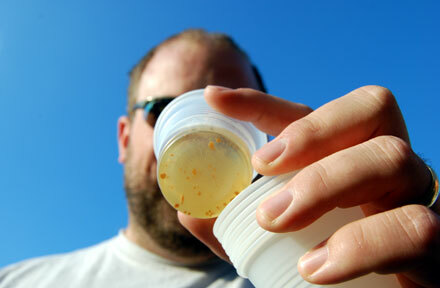 Why it worked: The crisp malt flavor in the Cream Ale helped balance the spiciness in the olive oil. Why it worked: There's a peppery element in the spring mix and the smokiness (from smoking on the egg) that pairs nicely with the finish of the beer. 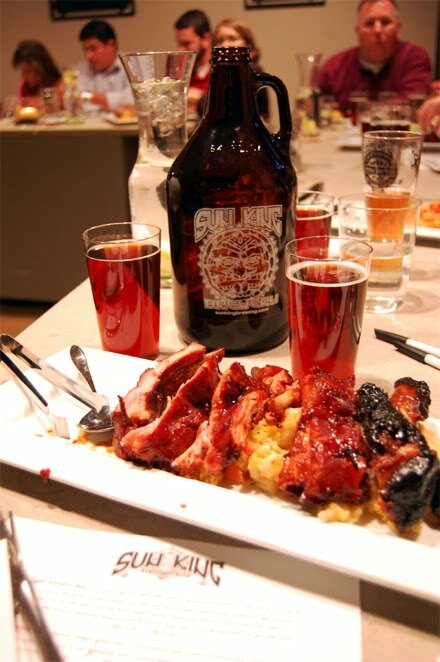 The savory, maple syrupy bacon and pear sweetness matches the sweetness in the beer, and the dry finish of the beer prepares the palate for the next bite. Each of these elements taken alone may have been too much, but there was something really special about the way everything worked together. A wonderful way to start the evening. This beer is made with poplar syrup from Hickory Works in Trafalger. 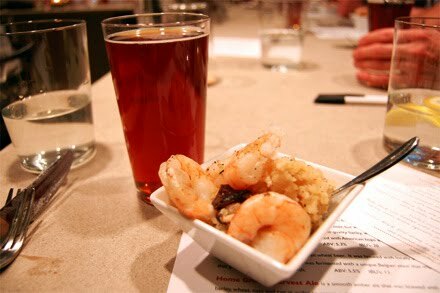 Why it worked: The earthiness of the of the mushroom along with the light smoke flavor that came through in the prawn lent itself well to the rich earthy hop finish in the harvest ale. Why it worked: This pairing reminded me of a Christmas dinner. The sweet stuffing with the peppery quail worked well with the citrus and spice from the hops in the beer. Why it worked: Having taken my first few bites before chasing the food with beer, I didn't get much coffee out of the sauce on the ribs - more so a nice sweetness from the sauce and the fat on the meat. The first drink of the Java Mac revealed the coffee elements in the ribs. Once revealed, there is a nice, roasted and nutty flavor in the Java Mac. 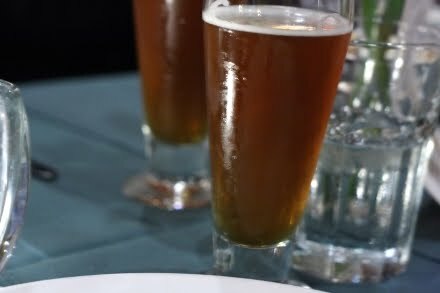 The celery root, squash, potatoes and carrots were a nice accompaniment, and in this case the beer worked well to cleanse the rich flavors of the vegetables, preparing the palate for the next tasty bite of the ribs. Why it worked: The brownie has elements of a rasiny sweetness, with element of cinnamon, and almost a pumpkin bread-like flavor. 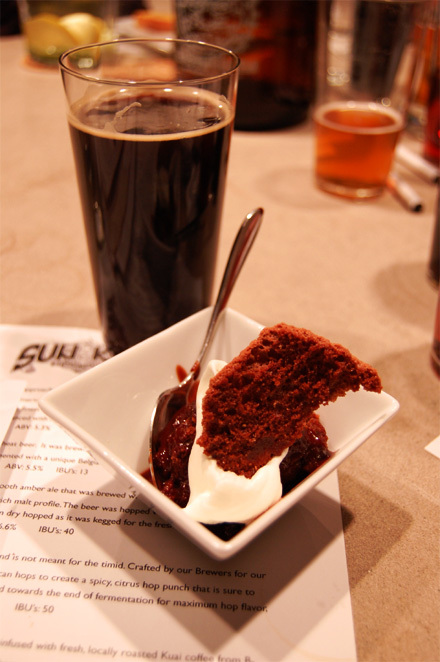 In this case the beer didn't refresh the palate - instead the brownie brought out sweeter elements in the black IPA that you might not normally expect. * All quotes are totally made up. Kinda. What keeps you coming back for craft beer? 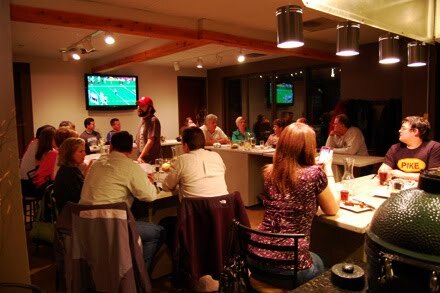 UPDATE - Upland Tasting Room now open!